Ben is Full of the Joys of Spring! 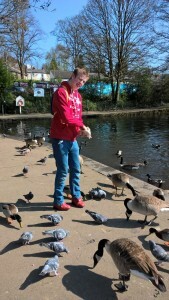 Ben was full of the joys of spring and recently took a trip to Etherow Park to feed the ducks! Ben has autism and ADHD, so he has a tendency to rush off, but Ben loved spending time at the pond. Ben had an information leaflet from the visitors centre that helped him to identify which birds were which, and he enjoyed spotting some that he recognised. Ben had also brought seed to feed to them, he was very pleasantly surprised and laughed when the geese and ducks flocked to him for a lunchtime snack! Independent Options is a registered charity with almost 40 years’ experience of removing the barriers that society places in the way of people with disabilities and those who love and care for them. It currently provides support services to over 600 children and adults with a range of disabilities. The Stockport-based charity aims to empower people with disabilities so that they can take control of their lives, achieve their aspirations, and live life to the full.